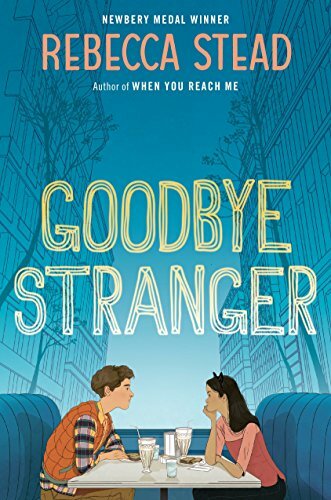 While Goodbye Stranger might not win the hearts of some Rebecca Stead fans, it will get them thinking. Bridget Barsamian, or “Bridge,” occupies the center of Goodbye Stranger, along with her two best friends, Tabitha and Emily. The three swore allegiance to one another in fourth grade with the one ground rule that they would never fight: a worthy precept in today’s contentious society. Stead’s depiction of this friendship will serve as an ideal model for today’s middle graders (and those older) who often seem more interested in alienating peers than collaborating with them. Surrounding these three friends, now in seventh grade, are assorted siblings, parents, crushes, other friends, home life, school life, and extra-curricular activities. Stead takes on social media, school dress codes, nascent romance, honor, and feminism—all of which make this a very busy book. Perhaps a bit too busy when, among the chapters about Bridge and her buddies, Stead inserts somewhat puzzling entries about a situation unfolding for an unnamed high school student. Some middle readers might have difficulty with these entries, which Stead presents in present tense (the rest of the book is in past tense) and second person. It seems as if the author is addressing the reader directly. “You paint your toenail. You don’t steal nail polish, though,” begins the first of these sections. “You should have known about Vinny. You did know,” begins another. The mysterious “you” has a group of friends, Vinny, Zoe, and Gina, who at least have names, but whom Stead drops into the text without any formal introduction. It takes some serious sleuthing to sort out who’s who, what they did to one another, and why we should care. “You” is having a very bad day. “You” did something terrible to a friend and has decided to take a mental health day from school without parental permission or knowledge. Some readers will likely find this story, inserted rather randomly into the tale of Bridge and her crew, more annoying than compelling. You the reader wants to know who “you” the character is and what “you” did. And you’ll wonder why the author is keeping it a secret. It’s a clever device that doesn’t quite work. Meanwhile, quirky, likeable, honor-bound Bridge is developing a budding friendship with Sherm, an equally quirky and likeable boy who lives just down the block. Stead is a master at character development and dialogue and is at her absolute best when writing the exchanges between these two. Underlying the kids’ exploits, experimentation, and escapades is the truism that although we change as we develop and relationships get more complicated, old friendships don’t have to end. Emily weathers her ordeal with the support of her family and friends, despite a few of their misguided good intentions. Despite the fact that the three girls are clearly growing in different directions, their friendship remains solid, and we believe it will continue. This is what Stead does best: calibrate true north for her readers and set her characters spinning.